Bitcoin and Ethereum are two major cryptocurrencies. But there are some critical differences between the two as both have been developed with very different purposes in mind. At first, it is hard to find differences between these cryptocurrencies, but as we dig a little deeper, we can discover the contrast between them. 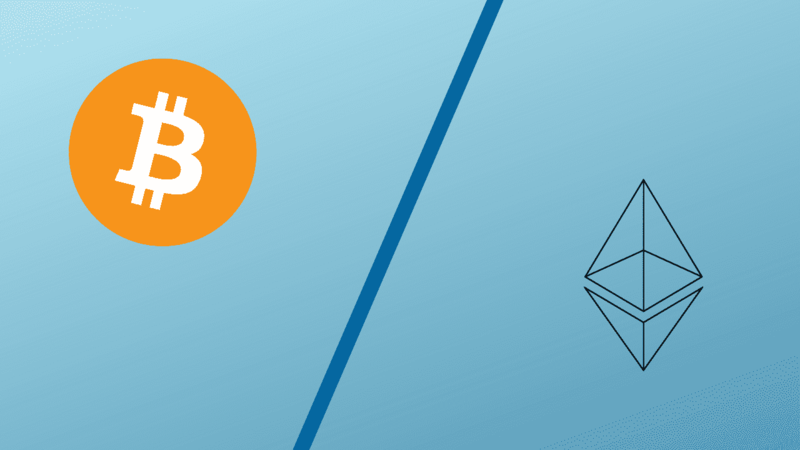 Let us take a look at the differences between Bitcoin and Ethereum and how those differences affect their profitability. Satoshi Nakamoto, Bitcoin’s creator, describes it as a decentralized peer-to-peer electronic cash system. Blockchain is created using a mathematical equation that adds blocks to a chain of transactions. Each block gets a hash code from the previous block to timestamp the newly added block in the blockchain. Addition of new blocks in the blockchain is done by miners who compete against each other in order to figure out a mathematical equation (SHA-256). Extensive computer processing power is required for this process. In contrast, every miner (node) on the blockchain works together to create the longest chain of transactions. Everyone involved in the blockchain creation ensures that atleast fifty-one percent of the nodes remain honest so that the whole blockchain remains honest. The chain is validated by implementing the consensus. Overall, this proof-of-work concept is at the core of Bitcoin’s protocol. Bitcoin differs from Ethereum in a number of aspects. Firstly, unlike Bitcoin, Ethereum is a centralized software platform. Moreover, Ethereum supports a dual account structure where both private key, controlled, and contract-code accounts exist. These are officially called smart contracts. Predetermined actions are executed by smart contracts when cryptos are received by them. Solidity is the programming language used by Ethereum. Also, it provides for easier smart contract integration. The protocols which are used for token creation in Ethereum are ERC-20 and ERC-721. Between these two protocols, ERC-20 has become the primary token creation protocol in the cryptocurrency space. Whereas, ERC-721 is being rapidly adopted thanks to an increase in tokenization of both digital and real-world assets. The primary functions behind Ethereum’s mining process and Bitcoin’s mining process are essentially the same. In both cryptocurrencies, nodes compete with each other to complete a predefined mathematical equation. The mining algorithm used by Ethereum is Ethash, while on the other hand, Bitcoin utilizes SHA-256 mining algorithm. The proof-of-work systems are used in both mining processes. Consequently, large amounts of electricity are consumed by both the cryptos when mined. The profitability comparison between Bitcoin and Ethereum mining processes is difficult to compose as there are so many factors to consider. A substantial investment is required to start up the mining operation in both the cryptocurrencies. Also, we should take into account that blockchain development process is much complex than any other software development. Furthermore, Bitcoin mining process is much scarcer than Ethereum mining process. This could lead to substantial gains in the value of Bitcoin in the future. However, both the protocols of Ethereum, which are ERC-20 and ERC-712, serve a unique purpose in the cryptocurrency space because they are the backbone of majority of tokens in the marketplace. This dependency signals towards a scenario where Ethereum might overtake Bitcoin regarding total market capitalization in the coming years. Mobile app revolution: Is it dead or just begun?